CL815 Loading Belt Conveyor is a 10 meter belt loader that’s ideal for Compost, Chicken Litter, Fertiliser, Dirt, Lime, or rock and makes loading spreaders and trucks easy work. It can load a 30t tipper with Compost, Manure, Chicken Litter, Fertilizer, Dirt or even lime or rock in as little as 7 to 10 minutes (depending on material). The job of clearing your chicken sheds, for example, loading straight into trucks becomes faster and easier with the LC815 loading conveyor with a 10 meter long conveyor reach and a useful 4.5 meter clearance/height. The LC815 is powered with a water cooled Kohler diesel engine and has a hydraulic drive to the belt. The belt and lift is remote controlled for easy use and allows the driver to stop/ start the belt and lift/lower the conveyor from the cabin of the bobcat etc. allows driver to stop/ start the beltor lift/lower the conveyor from the cabin of the bobcat. 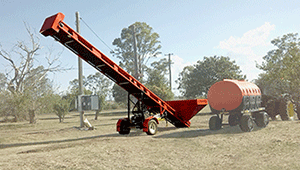 This great loading conveyor from OZ Turners will be the best solution to your loading problems saving you time and money, and is ideal for on farm composting or paired with our Bagger 2 and Bagger 3 semi-automatic bagging machines. The CL815 Loading Conveyor is made locally in Australia means and assures better service and quality we are your local conveyor manufacturers. Please contact us for further information.